President Donald J. Trump appeared nonchalant about a scheduled meeting with North Korean dictator Kim Jong-un, suggesting on Tuesday that it might not happen. The meeting is scheduled to be held in Singapore. Trump said that he believed that Jong-un was serious about meeting, but that if he did not meet the set conditions, it might not happen. 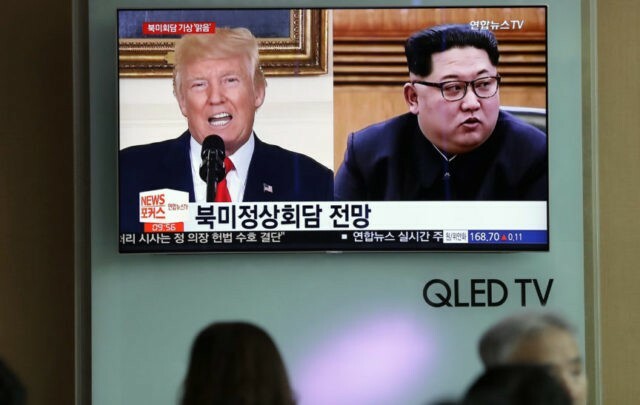 Previously, Trump has said that White House advisers had not heard from North Korean officials about canceling the meeting, but North Korean officials expressed frustration with U.S. demands of denuclearization. Trump signaled to Kim Jong-un that he would benefit from denuclearizing the Korean peninsula, promising to guarantee his personal safety and invest a great amount of money into the country if a deal could be reached. “We’ve talked about that from the beginning. He will be safe. He will be happy. His country will be rich. His country will be hardworking and very prosperous,” Trump said. He pointed to the success that South Korea had reached with the United States as an economic and political ally. The president again pointed to Jong-un’s second meeting with Chinese officials, suggesting that his eagerness to strike a peace deal changed as a result. “I can’t say that I’m happy about it,” Trump concluded. President Moon, however, appeared optimistic about the meeting actually taking place. President Moon’s national security adviser Chung Eui-yong also appeared optimistic that the meeting would happen, during conversations with South Korean media.